I have a quick and easy tip for you! With my student desks, the students would have folders where they were supposed to keep their incomplete work in there. Of course some students did and some just shoved their papers in their desks. I found this idea somewhere on the internet five or more years ago. 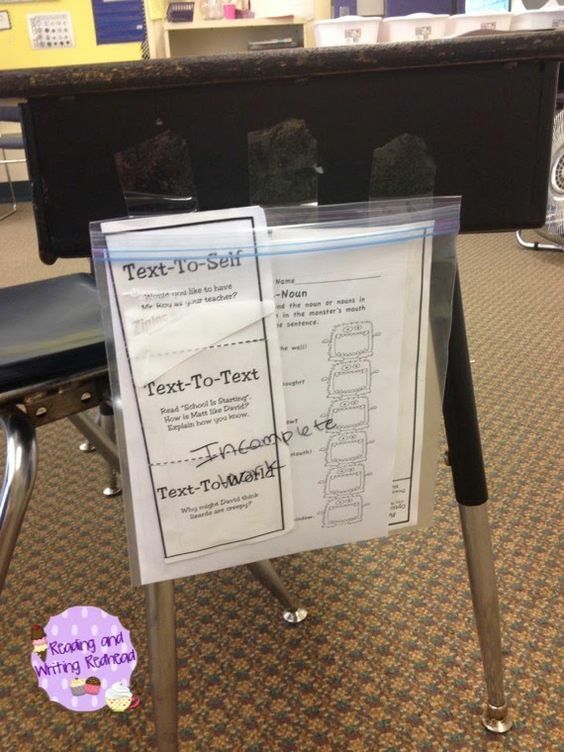 Just take a large plastic bag and tape it with packing tape to the side of your students' desks. I wrote on the side "Incomplete Work" with a sharpie. Then you can see exactly what students need to complete. And another piece of advice - initially I tried taping it horizontally along the top edge of the gallon size plastic bag, but if a student got more than a few papers in in their sleeve, or bumped into it or they were a little rough when they pulled stuff out, the bag would fall so I added the less attractive vertical pieces of tape. Hey, it holds, though! Also, it is easy for parents at conferences to see how much work their students have to catch up which can help you if you are concerned. It is also a cinch to just reach in, pull the papers out and right there at the desk, and review them with the student. Genius! I'm definitely trying this out! Thanks for the great idea!